GMA SHRM – A Retention Tool? I am excited and honored to be stepping into the President role this month! When asked how long I have served in a volunteer position with GMA SHRM, I have to sit and think about it because it’s been so long and I have enjoyed every minute! It was not my intent to lead the chapter when I started as a volunteer but I quickly became engaged because of the wonderful group of volunteers that serve us. I’m probably biased but we are part of the best SHRM chapter in Wisconsin! I look forward to ensuring we continue to thrive and serve our membership with great programming and opportunities for collaboration. Speaking of great opportunities, we recently held a “greet, meet and eat” event that was wildly successful. It was simple – a coordinated lunch event where members could meet each other. We will continue to look for fun and non-traditional ways to encourage relationship building among the membership. Another opportunity for members to meet with peers and discuss their topics of interest is at our HR Advice Network Roundtables. If you would like to collaborate with other members, these are intimate and convenient events because we hold monthly meetings of 25 attendees or less on the East, West and South sides of Madison. You will find details and how to RSVP on our website here. We look forward to serving you over the next year! IIn April 2018, the Department of Labor ("DOL"), Department of Health and Human Services ("HHS") and the Internal Revenue Service (collectively, the "Agencies") issued a package of resources relating to compliance with the Mental Health Parity and Addiction Equity Act of 2008 ("MHPAEA"). The MHPAEA is a federal law requiring group health plans and health insurers that offer mental health and substance use disorder benefits to make the treatment limitations and financial requirements for such benefits no more restrictive than those applied to medical and surgical benefits offered under the plan. It generally applies to employers with 50 or more employees. Are you looking to understand the employment laws applicable to employees struggling with opioid abuse, looking for a way to address the needs of your current employees and their families, and looking a way to help the Madison Police Department interrupt the cycle of addiction in our community? “The Legal and Practical Impact of the Opioid Crisis on the Workplace”. This important session will be presented by Brian Goodman, attorney with Boardman & Clark and representatives of the Madison Police Department. Brian Goodman will analyze the challenging legal issues presented at each crucial stage of the employment “life cycle” and provide key strategies for navigating safely through the legal labyrinth surrounding these issues. Then, representatives from the Madison Police Department will present information on the Madison Addiction Recovery Initiative (MARI program) that strives to provide quicker access to treatment to people addicted to opiates who are committing low-level property crimes and who may have simple possession charges. They will also discuss opiate abuse statistics in the Madison area and how it impacts employers at all levels. Find more information or register now for this PDS on September 18! 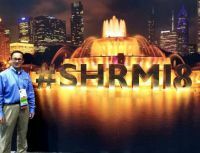 I had the great opportunity to attend the 2018 SHRM Annual Conference in Chicago last month. While I’ve been a member of SHRM for about 15 years, this was the first time that I attended a SHRM Annual Conference. Since it was being held just down the road, I felt that this was as good a time as any to attend. I’m glad I made that decision! How did I prepare for my first SHRM Annual Conference? After a few moments of extreme anxiety (I’m a usual introvert and not a fan of large crowds) in the months leading up to the conference, I started getting involved online. 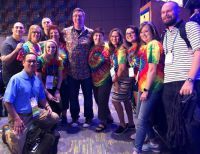 I kept up with updates with the SHRM Annual Conference online communities, followed the SHRM Blog Squad, and interacted regularly on Twitter using hashtags: #SHRM18 #HRTribe #HRonPurpose #HRSocialHour and others. I vowed not to “overplan”, which is my usual reaction, and tried to plan just enough, yet go with the flow. With my online schedule set on my SHRM Conference App, I was ready to go! Since it was a short ride to Chicago, I decided to take a bus down the first day of the conference (Sunday) and arrived in Chicago late morning and made my way to the conference site. McCormick Place, where the event was being held, several times but I was not prepared for the overall “SHRM Experience” that I immediately felt upon arrival. Banners, signs, volunteers, the branding was incredible and as one attendee remarked, “this is HR Disneyland!” The volunteers and staff onsite were incredibly helpful and my registration went extremely fast. With my badge and conference materials I was on my way….to where…that would be the question. Michael Aitken – As a SHRM A-Team Captain, I always enjoy listening Mike’s public policy updates and he did not disappoint! Jeb Bush – Pleasantly surprised by his knowledge of current issues and non-partisan solutions to today’s challenges. Adam Grant – By a longshot, the most dynamic keynote speaker that I have ever heard. Sheryl Sandberg – Having Adam Grant “interview” Ms. Sandberg was a unique and informative experience to have both on the same stage. Smart Stage – The short, 18-minute “TEDTalk-esque” presentations were for me, one of the highlights of the conference. So many great speakers and topics in a short period of time. Johnny C. Taylor, Jr. – What can I say about Johnny? Dynamic, passionate, inspiring, funny, engaging…the positive voice and leader of SHRM. 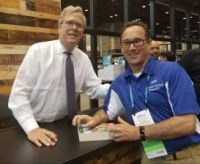 Meeting Governor Jeb Bush during his book signing. An opportunity to participate in a PayCom sponsored podcast “HR Break Room”. The acapella group Pentatonix performing live…just for SHRM. SHRM Foundation Lunch – Learning about the great opportunities that SHRM is providing to promote our profession through scholarships and other means of support. SHRM Steps Challenge – I had no idea how many steps I would be taking throughout the conference and was amazed at the end. With our Team Marchers4HR finishing in the top 3, I had the privilege to represent our team at the final general session in the SHRM VIP section for the awards presentation. All of the many, many networking experiences, connections and friendships made and solidified throughout the entire conference. 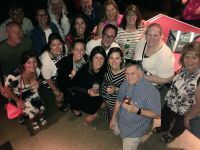 This included some GMA SHRM connections (Natalie Busse, Ashley Matthys, John Komosa) and other chapter leaders from across Wisconsin. It may seem like hyperbole to say that a 3-day conference was “life changing” but clearly, this conference has impacted me both professionally and personally in more ways that I can count. In a word….transformational. While the conference was a great opportunity to hear from a large number of world class professionals in my field during many sessions, the greatest takeaway was from the meetings and discussions with HR colleagues throughout the events. These connections will continue long after the conference ended. The morning started with coffee (readily available all day – they know their audience), light breakfast, & networking. It’s such a pleasure to catch up with familiar faces from past GMA SHRM events, and welcome those ‘first time attendees’ who are new to the chapter. 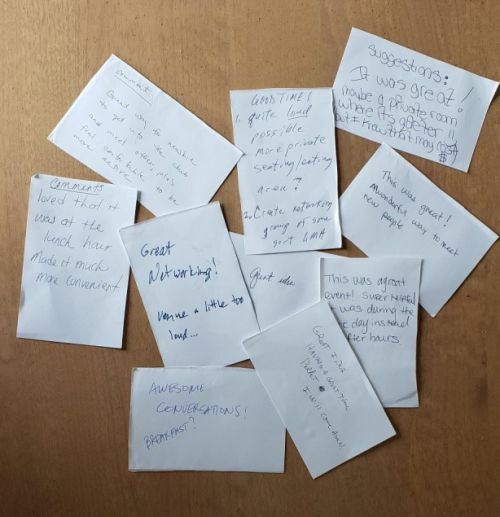 Folks that join GMA SHRM consistently site ‘networking’ as their top reason for joining – and there was plenty of that, with 240 attendees! Break time: More networking, and chatting with GMA SHRM’s outstanding sponsors. The sponsors were SO great, they even went above and beyond with their give-away-swag: attendees got Wisconsin shaped cookie cutters, a lion stuffed animal wearing a “Wild About HR” t-shirt, & designer chocolate, to name a few. This isn’t your standard ‘free pen & note pad’ kind of event. Breakout Session 1 – while there were numerous options, I choose the ‘Say Hello to Exit Interviews’, and learned about the right timing, length, and content of exit interviews. Attendees at this session listened to exit interview best practices from companies of various sizes and focuses – coming from a small, family-owned organization, this was extremely valuable information for me. Lunch – everyone’s favorite! Followed by the 2nd half of Mr. Horsager’s keynote speech. Queue the ‘aha’ moments. Breakout Session 2 –I choose to attend ‘Controlling Anger Before it Controls the Team’. Not sure if that says anything about me but...it was an impactful presentation! There were laughs as the group discussed adding games or fun to brighten things up at work (try speaking in a British accent, it’ll diffuse a tense situation immediately!). Breakout Session 3 – the Future of HR. Another stellar choice, as SHRM Field Services Rep Callie Zipple discussed the new realities of the workplace. Anyone in attendance was given the info necessary to be ahead of the curve on innovative workplace technology affecting HR. Think intelligent apps, new twists to paid leave (paternity leave anyone? ), and more. Just when you think the day is over – HR Happy Hour begins! Drinks, apps, more networking – at this point in the day, everyone knows someone new and networking comes with ease. Attendees received a raffle ticket, and GMA SHRM reps raffled off top-notch prizes, donated by the generous event sponsors (a pair of Badger basketball tickets!? Yes please!). GMA SHRM also raised $425 for the SHRM Foundation through their silent auction. I walked away feeling great, with a surplus of tactics and info to take directly to my team, and a few new ‘HR friends’ to boot. Can’t wait until next year’s GMA SHRM Human Capital Conference! In this tight labor market, human resource professionals face increased pressure to unearth new ways to recruit and retain talent. Organizations in search of young and skilled labor are often looking for creative solutions to attract talent. One creative solution employers could consider is a Student Loan Repayment Program (SLRP). Traditionally, organizations have utilized Tuition Reimbursement programs to provide financial assistance to employees who are furthering their education while already part of your workforce. SLRPs are designed to help those who have already made the investment in their education and are now repaying the student loan debt they incurred in the process. Student loan debt is now the largest consumer debt in the market. That makes SLRPs an attractive incentive, as such a program can help assist the 44.2 million Americans tackle the nearly $1.5 trillion in student loan debt they already have. The average graduate from the class of 2016 has outstanding student loan debt of more than $37,000. A SLRP can aid an organization’s efforts to attract and retain employees, as such a program can provide enrollees with a quicker, easier path to lower student debt. For a nominal fee, SLRPs provide employers with an administrative solution for convenient payroll deductions for loan repayments, consolidation and repayment tools and even 529 plan contributions. When implemented, organizations can leverage such a program in a way that fits their talent acquisition strategies. The most effective approach we’ve seen in the market includes companies making a financial contribution to the payment. This encourages employee participation, enhances their financial well-being and even allows them increase their participation in a retirement plan program. Under current IRS rules, employer contributions to SLRPs are treated as taxable income for both the employer and the employee. But employers can utilize various strategies to structure employer contributions to meet specific goals such as basing them on tenure or employee class. Student Loan Repayment Programs are an emerging benefit to help employers enhance their talent acquisition strategies and the financial well-being of their employee population. Because we know you read the newsletter ALL the way to the end, you’ve noticed that each month we encourage members to share their successes, or the successes of their colleagues, in the ‘Movin Up’ section. Movin Up is a spot for us to recognize our HR colleagues that have started with a new company or been promoted. HR Managers can run a ‘shout out’ in the Movin Up section for the HR Team Members they supervise – by recognizing staff, you are strengthening their likelihood of retention & job satisfaction! Evidence-based management has become recognized as the preferred approach to decision-making. Opinions, experience and intuition still play a role but relevant evidence has become the preferred basis upon which organizations choose to make critical decisions. Marketing and Finance have evolved through the use of research, analytics and the scientific method. HR has begun to incorporate talent analytics into strategy formulation as well. New approaches such as scenario-based workforce planning, hypothesis formulation and testing and artificial intelligence require new skills and knowledge and HR professionals need to “up their game” in order to use them well. This session will explore how evidence is acquired, analyzed and applied in talent management. Understand how to integrate evidence with personal knowledge and experience to formulate recommendations relating to talent management strategy. The federal and Wisconsin Family and Medical Leave Acts continue to be two of the most complicated laws to effectively administer in workplaces. This program will walk through scenarios that raise some of the most difficult issues under the FMLA laws. You will leave with a clearer understanding of proper steps to take and steps to avoid in handling your most challenging FMLA situations. One of the areas we are focusing on is providing more face to face time with our members. We realize many GMA SHRM members would like the opportunity to meet other members but may not have time to attend the other events requiring several hours of time commitment. We are always looking for ways to create more engagement opportunities for our members. Meet, Greet & Eat is our answer. Our luncheons will be held in different locations in Madison providing easier access to the venues based on your office location. Last month on June 14 at the Waypoint we had our inaugural Meet, Greet & Eat and boy did we! 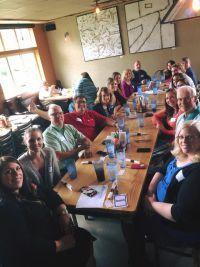 We had 23 members attend and got to know one another over lunch and make some real wonderful connections. Yes the venue was a bit loud but let's not forget we contributed to a lot of that noise through wonder conversations and interactions! Our next Greet, Meet and Eat will be somewhere near the Westside and we hope you join us. ﻿GMA SHRM welcomes the following members who joined our chapter in May 2018! 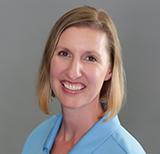 Nicole Liederbach Spectrum Brands, Inc.